Damned Pilots are a heavy stoner metal band who could be described as a much heavier version of Ghost, they have been busting skulls and shattering stages since 2011. This band has an excellent groove and an impressive force behind their music, but they invoke this force in an altogether unique manner, with harsher vocals and hard hitting guitar riffs. The end product is a wonderful doom inflected band who truly know how to rock. I love the classic rock vibe behind the bands sound which becomes especially poignant under the grittier vocals. It allows the music to take on a Clutch like flavor at times. Overall, the key to this band is the riff, with huge guitar lines that call up a special sort of heavy metal might Damned Pilots are simply a lot of fun to listen too. 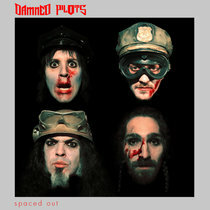 With a great blend of groove and brutality Damned Pilots have a raw rock energy that simply won't get old anytime soon. Although they have just an EP out so far the future should be bright for these Dutch rock and rollers!